Can you trick your pals into believing you used a stick of butter to make your banana bread? I think so! Snack Girl made this banana bread last year and substituted buttermilk and a little oil for the butter. Did anyone notice? No! They didn't know that I had slashed the amount of saturated fat and some of the calories. I even added a little whole wheat flour to the recipe for a nutritious bump. 2. I made 4 SMALL loaves of bread. The white whole wheat flour worked great! Everyone loved the banana bread and I was happy that my family got all the nutrients of a whole wheat flour. Why did I make small loaves? Well, each of my loaves is 460 calories TOTAL. Even if you were to wolf down most of my banana bread in one sitting, you would be doing better than ONE slice of banana bread from Starbucks - 410 calories. Also, I bet my friends would prefer a SMALL treat because of all the crazy holiday food that comes their way. Give this as a gift and don't mention the substitutions. Wrap it in some holiday cellophane with a bow. Please share your banana bread "tricks". Preheat oven to 325 °F. 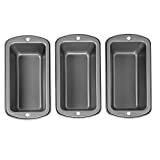 Lightly grease a loaf pan. Using a whisk or a fork beat eggs and sugar in large bowl until thick and light. Mix in mashed bananas, buttermilk, oil and vanilla. Add flour, baking powder, baking soda and salt. Mix until just blended. Pour batter into prepared pan. Bake bread until golden brown on top and butter knife inserted into center comes out clean, about 1 hour (40 minutes if you are using the small loaf pans). Turn bread out onto rack and cool. Fast, Delicious, Healthy - What Else Could You Want? So how big would your serving size be with the nutritional info you provided? Yum! Sounds good....I'm going to make it. Thanks for sharing! I have the same question as above...are the nutritional facts for a small loaf? are for one slice of banana bread (10 slices for the large loaf). probably about 6 small slices in the small loaf -77 calories per slice. I hope this is helpful. try whole wheat pastry flour for baking - it is less dense than the "all purpose" flour and gives a yummy, nutty flavor. I just made some pumpkin butterscotch muffins that were also a great snack. Mmm, I've been looking for a good low fat banana bread recipe! Thank you so much! Would you mind if I share it on my blog? 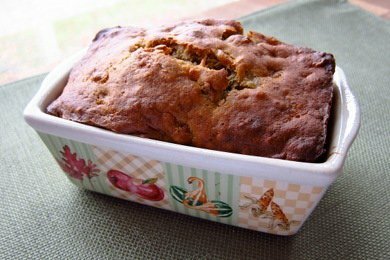 I love banana bread and this sounds great and healthier too. You say you used all white ww flour. Do you think the regular ww flour would work too? Usually when I bake anything I use 3/4 white and l/4 ww and that works. @Myrna - stick with that ratio of WW to white flour. The white WW flour is fluffier and so you can use 100% and the banana bread doesn't get too dense. One of my tricks is to add flax meal to every bread I make. I love it because it adds a nutty flavor, but it also adds fiber and omega 3's! My 3YO loves it and I love that it's good for him. I even used flax and water as a substitute for eggs in a vegan pumpkin bread I made for a friend. I highly recommend the addition! Why do you need the 1 TBS oil? I am curious. Can i use whole wheat flour only?? I made this today and it turned out well but since my family likes nuts and they're pretty healthy, next time I would add a small handful of chopped walnuts, almonds or pecans. Also, I should have lined as well as oiled my non-stick bread pan. The bread burned a little on the outside and stuck to the pan- baked for 55 mins.